A plain gray concrete driveway costs between $3 and $7 per square foot, while the cost of a decorative concrete driveway can range from $8 to more than $18 per square foot depending upon the design and coloring effects desired. Longer-lasting, less maintenance, and cost-effective are the top three attributes of driveways installed with decorative concrete. They are an ideal choice for getting the look of natural stone, patterns, or pavers without the cost associated with those authentic materials. 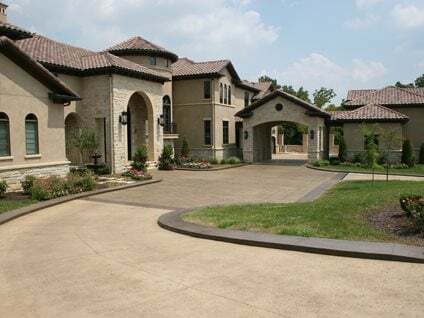 Plus, with concrete driveways, you have the added luxury of having a long-lasting surface that is durable and wear-resistant in the harshest environments, along with little required maintenance. 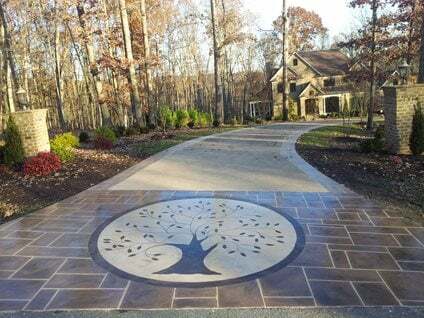 In addition, the design options and customization choices are nearly endless providing you with a palette of opportunity to create a one-of-a-kind driveway that can greatly enhance your home's curb appeal. More elaborate decorative effects allow you to incorporate contrasts and color and pattern. *Note: Costs shown vary by market depending upon the size of the project and the prices for materials and labor.